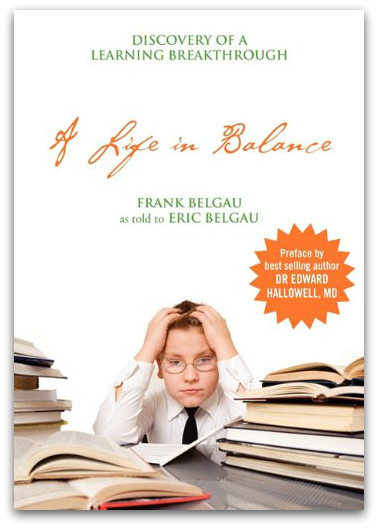 The book reaches back into the childhood of founder Frank Belgau, who himself struggled with reading. Eventually, Frank was able to overcome his reading difficulties and went on to a successful military career. After his discharge from the service, Frank became a public school teacher, which began his unique and interesting career in special education and the development of his alternative treatments to dyslexia and ADHD. You can learn about his brain training and brain fitness program at his website. I found it to be very interesting to read the history of alternative brain exercises and therapies. I will admit that I am often skeptical of alternative therapies – and I began reading this book with a healthy dose of skepticism. However, as I read about the stepwise learning Frank experienced as he began working with children (who many educators had written off as uneducable), I realized that much of my skepticism was misplaced. Being able to “see” how these therapeutic techniques worked through the case studies presented was fascinating. The story of Frank’s career and discovery is interesting in itself. However, the second half of the book is a goldmine for those who are interested in apply his techniques – taking them for a test drive, if you will. Although I did not try The Space Walk with my boys, it reminded me of two things: (1) elementary school gym class – maybe they were on to something with all our simple relay games, ball passing games, and exercises, and (2) Luke’s reading took off once he became more active in sports – running, playing soccer, etc. He also had done some computer based eye exercises to strengthen the muscles in his eyes. But it did seem that he underwent some huge growth all around the same time. My recommendations & thoughts: I think this is an interest book to read for those who parent/ home educate children with learning differences. If you are wanting to “try before you buy” the Learning Breakthrough System, I think this would be a great resource and the The Space Walk program in the appendix could be a great way to understand his system.